Last weekend saw developments of what can be termed as anarchy and subservience taking place in Lesotho’s capital, Maseru. The turbulence had been spearheaded by the discharged commander of the Lesotho Defence Force (LDF), Tlali Kamoli. Following these events, the Southern African Development Community (SADC) security body held an emergency meeting in Pretoria, South Africa, on Monday 1 September, to discuss the precarious security situation. The country’s Prime Minister, Thomas Thabane, had fled from Maseru to Pretoria over the weekend. Army troops led by Kamoli had surrounded Thabane’s residence and then raided and surrounded police stations and headquarters (which they later claimed had been an anti-terrorist operation). This caused more than a hundred government officials, who were reportedly targeted by these soldiers, to go into hiding. The commander set to replace Kamoli, Lieutenant General Mahao, also fled the country on Saturday after a pre-dawn assassination attempt. Prime Minister Thabane presides over a coalition government – the first of its kind in the country’s history, but one that was a product of political expediency in 2012. It is made up of his party, the All Basotho Congress (ABC), Deputy Prime Minister Mothetjoa Metsing’s Lesotho Congress for Democracy (LCD) and the Basotho National Party (BNP), led by Minister Thesele Maseribane. The coalition arrangement had been formed after the country’s elections in 2012 produced a ‘hung parliament’ – where no one party has an outright majority to constitute government. The events of the weekend were set into motion when Government Gazette Legal Notice Number 64 announced Kamoli’s dismissal, and at the same time, announced his replacement, Lieutenant General Maaparankoe Mahao. In Maseru, this led to discontent from the LCD over the way that Thabane had handled the issue of Kamoli’s dismissal. Thabane, on the other hand, inferred that Metsing, his deputy and leader of the LCD, had orchestrated the actions led by Kamoli to compel him to lift the nine-month suspension of Parliament. The suspension, which has been in place since June 2014, had occurred amid feuding in the two-year-old governing coalition. Since then, it has become one of the main obstacles in the relationship between the Thabane and his deputy. The LCD, after its fall-out with Thabane’s ABC, had signed an alliance agreement with the Democratic Congress (DC) in July 2014 with the eye on forming a new government. This could only happen once the Parliament suspension is lifted. It is important to note that Kamoli had been appointed by the then-governing LCD in 2012, when its leader was the former prime minister, Pakalitha Mosisili, who is now leading the opposition DC. The SADC Troika emergency meeting was presided over and attended by South African President Jacob Zuma, as Chairperson of the SADC Organ on Politics, Defence and Security Cooperation; the SADC Executive Secretary, Dr Stergomena Tax; the leaders of the current coalition government parties; Thabane; his deputy and the sports minister, Maseribane. The 1 September 2014 joint statement by the SADC Troika and the leaders of Lesotho’s coalition government indicated an acknowledgement by the coalition partners that the political and security situation had deteriorated, and needed immediate intervention and support from SADC. What the coalition partners respectively sought from the intervention, however, was arguably not the same thing. Thabane, for instance, went into the meeting requesting the deployment of SADC peacekeepers to protect his life upon his return to the capital, and to help restore order. SADC, instead, opted for political dialogue. South Africa later fielded a contingent of the South Africa Police Service (SAPS) to reinforce public security in the capital, at the request of the prime minister. As for the SADC emergency meeting, it resolved that ‘the coalition partners re-commit to the Windhoek Declaration,’ an agreement that was facilitated by Namibia’s President Pohamba in August 2014, and which would have the coalition parties work together to ‘restore political normalcy, stability, law and order, and remove the Parliament prorogation'. First is the challenge of public security generally, and that of the ‘exiled’ officials when they return to the capital. While a request to field SADC peacekeepers in the capital was not granted, the challenge remains on reining in Kamoli and deterring him from further anarchist action, given his refusal to step down. Maseru’s police force remained in flux, and Thabane’s personal safety in the capital remains compromised, notwithstanding his return on Wednesday, 3 September 2014 and the support of the SAPS. The second is the need for political engagement between stakeholders in Maseru, and the SADC facilitator and the observer team, to happen in good faith. There is a perception that close relations between Zuma and Thabane could affect impartiality in an South African-led SADC mediation. It would be important for the appointed team to be seen as depoliticised and partisan. The third challenge is the arrival, timeframe and duration of SADC’s observation in the country. The strategies employed by the mediation team and how long they stay will determine whether they match the needs on the ground. The fourth challenge is that the Lesotho roadmap appears to focus solely on the three coalition partners as stakeholders in resolving the political question. Recognising the role of other political parties represented in Parliament, along with civil society stakeholders, is important. The roadmap, rather than being an elite pact, has to be a genuine national political settlement. Lastly, there are long-term structural issues in Lesotho’s polity that need to be addressed to avert the cyclical nature of political volatility in the country. 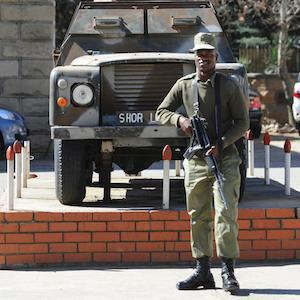 Lesotho continues to see the contestation for power during and after elections; extensive political interference in the security cluster, especially in the appointment of commanders of the police force and the army; and the use of the military, in particular, as a politicised and partisan tool. In the longer term, SADC’s scope to advise on electoral or constitutional reforms that foster a ‘tighter’ government, even if it is a coalition, and importantly also security sector reform, could be expanded. Ultimately, however, and similar to the Namibian-Lesotho facilitation, the success of the SADC mediation in Lesotho strongly hinges on the political will of the conflicting parties and on upholding what is in the national interest.